Crazy About Cats And Not Afraid To Show it? Get Ameowzing Cat Lover Gifts Delivered Every Month! 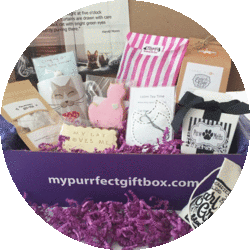 To order a My Purrfect Gift Box simply click on the GET YOUR BOX button above, choose your box and then sit and relax while we do the rest! There are only a limited number of boxes available each month - so order early to avoid disappointment! You love cats and aren't afraid to show it! While some may call you crazy, we believe you are just passionate about cats and we have the unique and beautiful gifts to help you tell the world you are one Purrfect Cat Lover! Looking for a unique gift for any cat lover? Our boxes make meowvelous presents - either as a one time box (no subscription required) or as a 3 or 6 month gift subscription. Gift subscriptons don't have to automatically renew so no worries about cancelling later. We started My Purrfect Gift Box to help make a difference in the lives of cats across the country. Therefore, a portion of each of your box subscription goes to support UK cat charities, rescue centres and animal shelters. So whlle you are giving to yourself, know you are giving to the cats that need us across the UK. Choose the size of box that is best for you - either with gifts just for you or include kitty too. Then choose your billing cycle: either month-to-month, every 3 months or every 6 months. The longer the subscription, the greater the discount. Change plans or cancel any time. We renew your subscription on the 5th of every month. We hand pack every My Purrfect Gift Box with fantastic cat themed finds - many of them exclusviely made by cat loving artisians. Then we first class ship your box direct to your door. Our boxes are shipped between the 20 - 24th of each month. 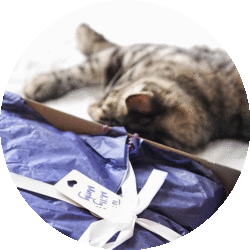 Our subscribers can't wait for their own My Purrfect Gift Box to arrive each month. Be delighted as you open and unwrap each of your purrfectly formed gifts. Then enjoy cat play time with the optional cat gifts and of course with the box! The contents of each gift box are a surprise! What we can tell you is this....Each month we dream up a cat-tastic new theme. We then source cat-themed gifts and products from all over the world to go into the box. We work with many global, cat-loving artisians so we can showcase their handmade items and pieces of work. Things you might find in a box include home decor, fashion accessories, jewellry, stationery, artwork, t-shirts, mugs and so many more things we haven't even thought of yet...but most things you won't be able to find on the high street. Gifts for kitty can include treats, all natural food products, fashion accessories and of course fun toys - AND they get the box too once you have lovingly unwrapped each of your gifts! Purchase a one time box without any subscrption. Perfect for a one time gift for your cat loving friends and family. Choose your items from our shop or purchase the curent box. Purchase a voucher as a gift for someone who would love either a subscription or an item from our shop. Shop items from past boxes! We have many of the items from our past boxes available for purchase. Visit our shop and have a look around. Great if you need a gift or just want an extra item from a past box.